Located in the prestigious Emerald Island Resort, a beautiful gated community, guarded 24/7, this exotic and gorgeous 7 bedrooms, (all equipped with flat screen TV sets), 4.5 bath (2 of which are en-suite masters). WILL blow your mind away! Featuring a sparkling heated pool/spa, which backs up to nothing but nature. A game room equipped with billiard / Ping Pong table, foosball, 2 television sets and several video games. A large, beautiful kitchen featuring black granite counter and brand new appliances. A fully equipped laundry room. The open family room has a large flat screen TV, and features a beautiful view of the large and inviting pool. Just to make it more interesting, you will have access to free internet / WiFi, premium cable; and free domestic calls. Emerald Island Resort, where Magic Castle is located; is known for its dazzling dolphin fountains, gorgeous landscaping, as well as for its proximity to Disney and all major parks. As our guests... you will have the right to utilize all the Resort has to offer, including clubhouse, TV / meeting room, sauna, fitness center, arcade, Internet cafe, Tiki-bar by the pool, volleyball, tennis and basketball courts, playgrounds, nature trails and much more. Come experience the "The Magic"! We do look forward to your stay. Pool can be heated for an additional fee. The only negative was dirty carpet on stairs. Other than that pretty perfect. Our apologizes, due to several back to back bookings our regularly scheduled carpet cleaners were not able to get in as scheduled. Stairs are now clean. Thank you. Great property managers; fully stocked home to accommodate large family group; comfortable; clean; very enjoyable. We had a great stay at the Magic Castle. House was very clean and has great amenities. The kids stayed entertained in the game room. Fit us all comfortably. 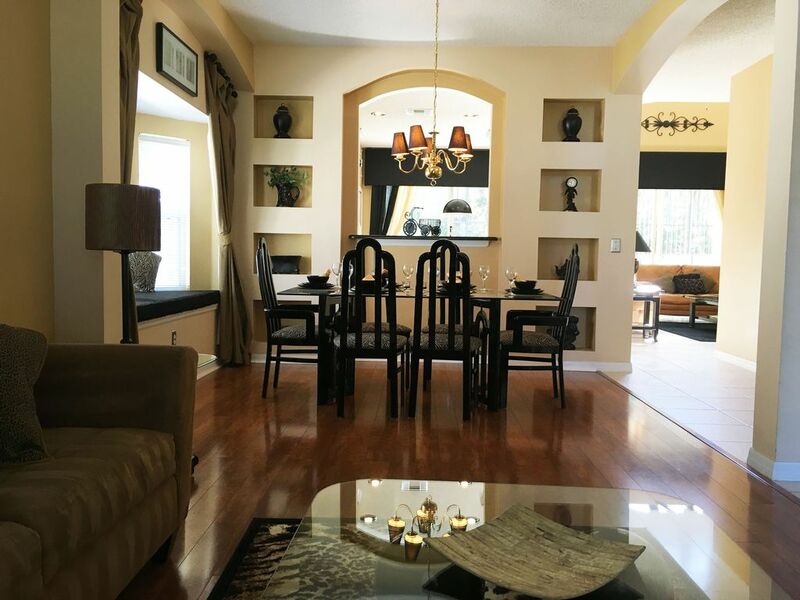 Nice Resort, spacious house, close to shopping and Disney Parks. Staff and owner were quick to respond to questions or concerns. Property description states there is a heated pool, but fails to inform you that you must pay extra for pool to be heated. My children and grandchildren were disappointed they were unable to enjoy a heated pool and spa. The house was just as pictured, it was clean and spacious enough to accommodate everyone and the grandchildren really enjoyed the game room. I would recommend staying here if you have a large group; however I recommend the owner provide an extra roll of tissue per bathroom; as one of my guest ran out in there bathroom and had to purchase some during our stay. My family and friends had a great weekend trip to Disney to celebrate our upcoming wedding. We arrived to the house Friday and did not receive a code to enter the house. The owner was quick to answer and we were right in. The house was roomy and comfortable and spacious enough for our large party. It was so close to Disney - a great location. We would definitely stay here again! Really nice house and everything was in good working order. Definitely recommend to anyone looking for a house to rent. The BBQ grill is free of charge, however, Propane is NOT provided; should the tank be empty upon check-in; please take the tank to any Walgreens pharmacy, 7-Eleven gas station or Walmart store to exchange for a full one. In addition, the BBQ grill will be clean upon your arrival, TO AVOID AN EXTRA $50.00 CHARGE, kindly clean the BBQ grill prior to your departure.